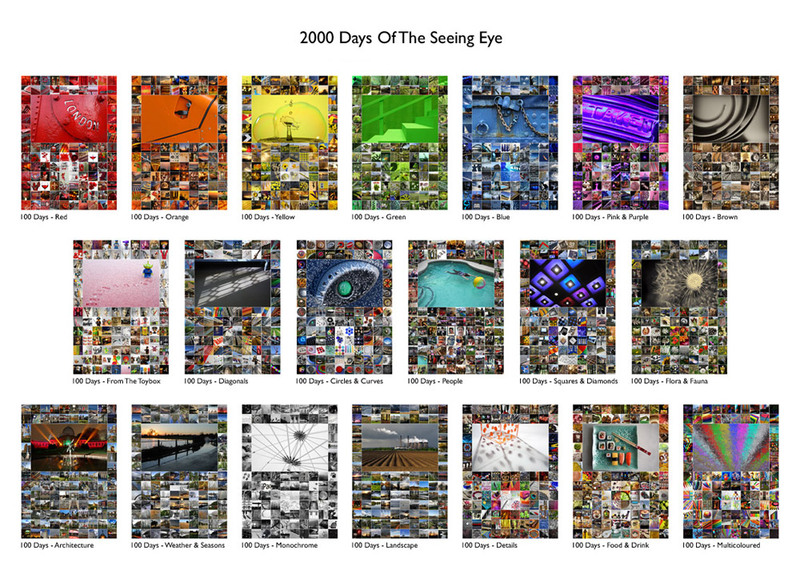 These images showcase my daily photographic diary, made over 2000 consecutive days between 1st January 2008 and 22nd June 2013. From the mundane to the momentous, it echoes the fluctuations of life’s daily rhythms, seeks out the quirky or humorous, turning the banal into something much more memorable. Attracted by strong colours, shapes and textures, my seeing eye often presents the world as a series of details picked out from a wider field of view. Thematic grouping has allowed subconscious patterns to emerge. The primary image within each mosaic was chosen to illustrate a consistent style, with bold design, across diverse photographic genres. Careful consideration has also been given to the placement of the supporting elements, as well as the overall visual flow of the panel. Select a thumbnail image to see a bigger version of the themed mosaics.